The Roland SDE-3000 is a high quality Delay Machine featuring various delay effects and also the Memory function that retains up to eight different panel settings, therefore, it is extremely helpful for both studio and live performance. Adopting the companding PCM equivalent to 16 bit, the Roland SDE-3000 offers such wide dynamic range (100dB) and low harmonic distortion (0.03%). Long Delay of 4.55 (Frequency Characteristic: 20Hz to 8kHz) is now available, which is specially useful for live performance. 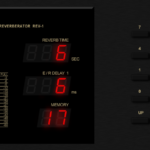 The entire Front Panel setting of the Roland SDE-3000 can be stored into memory. (The Input Level is not included here.) The accuracy of the Delay Time Display is as good as 0.4%. The time is indicated by 0.1ms step up to 10ms, and after that by 1ms step. The Input and Deley Output levels can be controlled, so that the lowest S/N ratio and widest Dynamic Range can be attainable. Basically, using the SDE-3000 as a Pre-amplifier should be refrained, as it is designed to be UNITY (Output: Input = 1:1). The FEEDBACK LOOP SEND and RETURN Jacks allow wide variety of the effect sounds. The Output jack for the inverted Modulation CV is useful for when two sets of the Roland SDE-3000’s are used. The Remote Control Jacks sum as DELAY ON/OFF, HOLD, PRESET SHIFT are provided for even wider variety in live performance.